"Butterfly", Caverns of Sonora, Texas. I am not any good at cave photography. But I've been in hundreds of caves all over the World, so at least I can compare them, and tell which ones are the most interesting and unique - something you won't find on commercial websites. 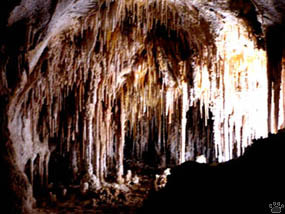 (Contrary to what you've probably heard, Lechugilla Cave in New Mexico is not the World's most beautiful). There are, however, thousands of caves I haven't seen yet, so it's possible that I've actually missed all the best ones. 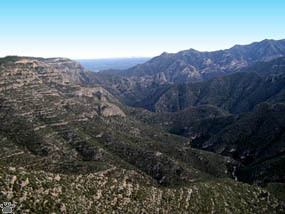 Guadalupe Mountains, an ancient coral reef shared by New Mexico and Texas, have the highest concentration of unique caves in the world. Frostwork, Wind Cave, South Dakota. The country with the most diverse and interesting collection of caves is the USA. 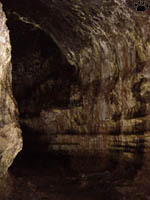 It has at least a hundred "showcaves" open for tourists, and thousands of ones not open, most of them on private land. Frostwork, Wind Cave, South Dakota. 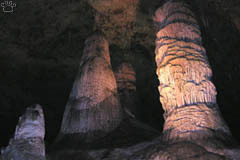 Caverns of Sonora, Texas. The major problem of caving in the USA is that getting beyond the "touristic" areas is very difficult. You have to either sign up on an expensive guided "wild cave" tour, or be a member of some caving organization. Otherwise you'll likely spend a lot of time trying to locate a cave, just to find a locked gate at the entrance. Sometimes it is done to protect the caves, sometimes - "for your own safety" (US citizens are not supposed to engage in any activities considered potentially risky without government approval). Missouri. Mammoth Cave, Kentucky, is by far the World's longest (580 km), and a must-see for people interested in caves, but its subway-like passages have only a few formations (some smaller cave around it are more scenic). It is a matter of taste, but I think that the most beautiful and overall impressive large cave in North America is Carlsbad Caverns, New Mexico. It also has spectacular bat flights in summer, and lots of cave swallows (Hirundo fulva). 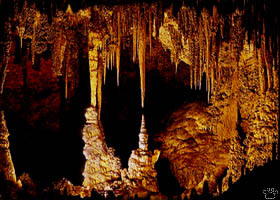 The only US cave I find even more beautiful is a little-known wonder called Caverns of Sonora, Texas. 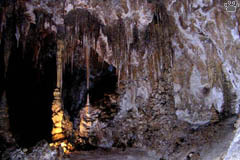 Carlsbad Caverns, New Mexico. 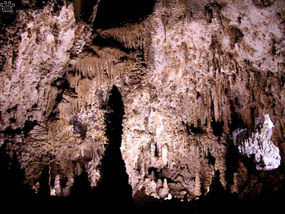 The numbers and diversity of wonderful formations in Carlsbad Caverns and neighboring caves are really stunning. 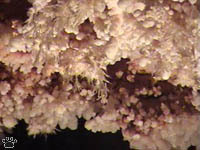 Cave spaghetti, Carlsbad Caverns. 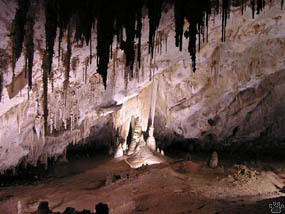 To see all caves in Carlsbad area that are open to visitors, you need at least a week, some advance reservations, and at least a hundred dollars per person. Carlsbad Caverns, New Mexico. Other caves worth visit are Onondaga Cave in Missouri, Alebaster Caverns in Oklahoma, and small caves in the vicinity of Mammoth Cave. 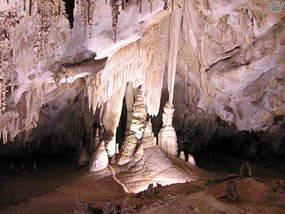 Numerous other showcaves in Texas, Indiana, Arizona, and other states have beautiful formations, but few of them are unique or rare, and visiting the caves usually isn't cheap. 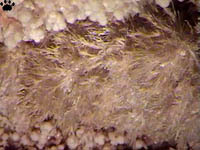 Frostwork, Wind Cave, South Dakota. 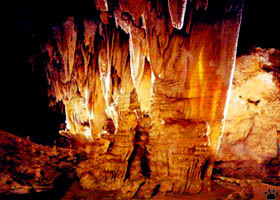 Wind Cave and Jewel Cave in South Dakota have a lot of unusual formations, like boxwork and frostwork. Alas, in Jewel Cave most of them are not in the area open for tourists. Boxwork, Wind Cave, South Dakota. Shasta Caverns, California. Shasta Caverns in Northern California and Oregon Caves in Oregon are located in beautiful, remote places, so getting there is part of the fun. Other California caves are somewhat less interesting. Kentucky. Caves of Kentucky-Indiana region and the subterranean rivers of Edwards Plateau in Texas have more species of cave animals than any other cave system in the World. 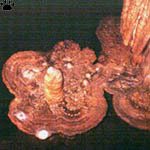 (I suspect that some tropical caves have even more, but they are not so well studied). Salamanders are particularly diverse there. But animals tend to avoid "touristic" caves, and most others are closed to public or difficult to find. Among the showcaves, Crystal Onyx Cave in Kentucky and caves of Spring Mill State Park in Indiana are good for salamanders; Blue Spring Caverns of Indiana - for blind cave fishes (Amblyopsis spelaea) and crayfish. Sinkhole springs of Florida are sometimes full of fish, and some are used by manatees in winter. Caves of California seldom have salamanders, but there are some rare spiders and pseudoscorpions there. (Plethodon glutinosus), Spring Mill SP, Indiana. Texas Snorkeling in San Marcos Springs, Texas, you can sometimes see blind salamanders (Typhlomolge rathbuni) being carried out of the aquifier by the current. But you have less than a second to look before they get consumed by catfishes and other predators waiting for them. 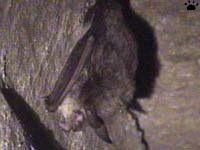 Bat flight, Carlsbad Caverns, New Mexico. Some Texas caves have huge colonies of Brazilian freetail bats (Tadarida brasilensis), but usually you are not allowed to see them - you can only watch bat flights from the outside. Bat flight, Carlsbad Caverns, New Mexico. Brazilian freetail bats, Lava Beds, California. So, if you want to see a large bat colony in the USA, you have to either break the law, or find a new one nobody knows about. 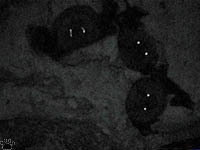 Cave myotis bats (Myotis velifer), Death Valley. Big brown bat (Eptesicus fuscus), North Carolina. 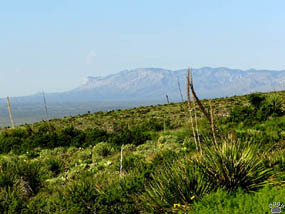 Look for bats in Big Bend State Park, Texas, Lava Beds Nat'l Monument, California, and (if you are willing to take some risk) in abandoned mines of Death Valley, California and Nevada. Brazilian freetail bats, El Malpais National Monument, New Mexico. Lava tube, Big Island, Hawaii. In addition to karst caves, there are some interesting lava tubes in the US: in Lava Beds; in El Malpais National Monument, New Mexico; around Mount Saint Helens in Oregon; and especially around Hilo and Volcano, Hawaii, where some are up to 65.5 km long. 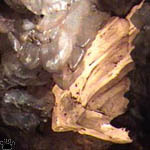 Lava tubes have few formations, but some of these are not found in karst caves. 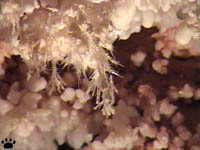 Both Hawaiian and Galapagos tubes have interesting fauna, such as cave spiders. 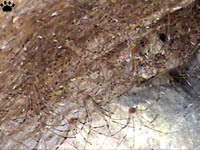 Windspiders are common in caves of American Southwest. They are fearless and fast predators. Painted Cave, Santa Cruz I, California. The World's longest sea cave is also a lava tube, 500 m long. 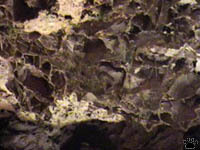 Called Painted Cave, it is located on the Channel Islands of California, and is large enough for small ships to enter. It is a very beautiful place. Painted Cave, Santa Cruz I, California. can be horribly overcrowded on weekends. 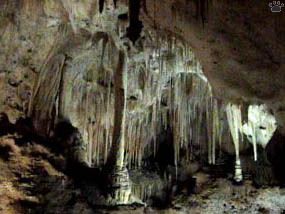 Many Carribean islands have lots of limestone and some interesting caves. 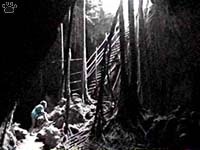 Giant, multi-level Caves of Camuy in Puerto Rico are probably the most impressive. 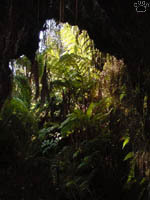 The island also has many "wild" caves. 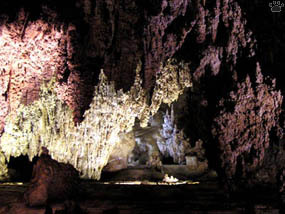 Cueva de Cucarachas, Puerto Rico. Entrance to Venta Cave, Puerto Rico. Part 2. 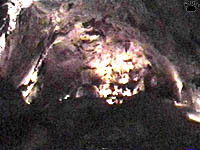 Caves of Naica Mine.